Few experiences are more rewarding than coaching a youth football team. Your journey through the season will be packed with moments that make you smile and that you and your players will remember for the rest of your lives. But what if you’ve never coached before? 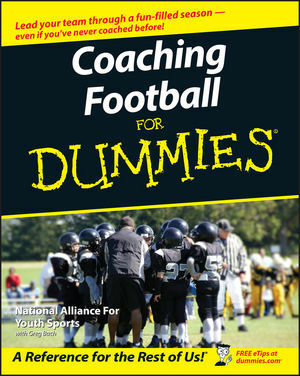 Complete with tips for working with parents, keeping your players healthy, and leading your team effectively on game days, Coaching Football For Dummies is all you need—besides a whistle and a clipboard—to navigate your players through a safe, fun, rewarding season! The National Alliance For Youth Sports provides a wide range of programs for coaches, administrators, officials, parents, and young athletes. Greg Bach is the Director of Communications for the Alliance. Part I: Kids’ Play: Getting Started Coaching Football.